Sale Sharks are considering a move away from their Edgeley Park home, which they currently share with Stockport County. 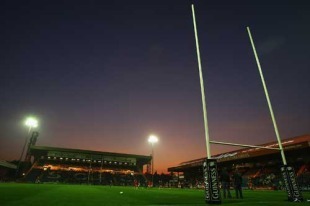 The Aviva Premiership side are mulling over a possible switch to Super League club Salford City Reds' new £26million stadium. The Sharks are committed to playing at their current home next season, but the 12,000-capacity City of Salford Stadium is a potential alternative beyond that. The ground is currently under construction and due to be opened next February at a site just off the M60 opposite the Trafford Centre. Sale are also exploring a possible three-way redevelopment of Edgeley Park between the Sharks, Stockport County and Stockport Council. "We are weighing up all the possibilities, and there are clearly possibilities in Salford as well as with Edgeley Park and elsewhere. There are a lot of things to consider," Sale owner Brian Kennedy told the Manchester Evening News. "However, we are not yet ready to make a decision and we've also got to consider seriously what is right for Stockport County, because that is important to us. We are in the process of working on some initiatives that will help Stockport and hopefully give them the best chance of getting back up into League Two. "So all these things are a factor right now and are in the boiling pot. Hopefully, we will come up with some initiatives over the next month or so. "But clearly Salford is one option that we are considering very seriously, and it's one that the powers that be are keen on. We are in the process of discussions and negotiations, and we don't know where that is going to end."